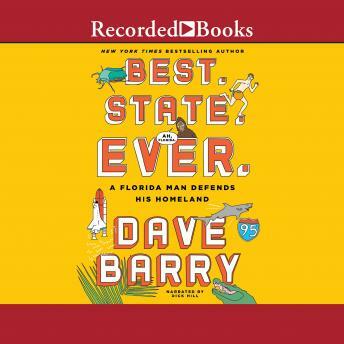 A brilliantly funny exploration of the Sunshine State from the man who knows it best: Pulitzer Prize winner and New York Times-bestselling author Dave Barry. We never know what will happen next in Florida. We know only that, any minute now, something will. Every few months, Dave Barry gets a call from some media person wanting to know, "What the hell is wrong with Florida?" Somehow, the state's acquired an image as a subtropical festival of stupid, and as a loyal Floridian, Dave begs to differ. Sure, there was the 2000 election. And people seem to take their pants off for no good reason. And it has flying insects the size of LeBron James. But it is a great state, and Dave is going to tell you why. Join him as he celebrates Florida from Key West at the bottom to whatever it is that's at the top, from the Sunshine State's earliest history to the fun-fair of weirdness and gunfire ("Our motto: 'Come back! We weren't firing at you!'") that it is today. It's the most hilarious book yet from "the funniest damn writer in the whole country" (Carl Hiaasen, and he should know). By the end, you'll have to admit that whatever else you might think about Florida-you can never say it's boring.